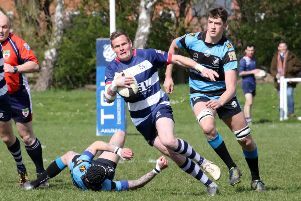 Banbury Bulls retained their four-point advantage in Midlands Two West South as they turned the tables on Berkswell & Balsall. Having lost to Berkswell & Balsall earlier in the season, the leaders ran out 27-10 winners in Saturday’s return, effectively ending the hosts’ promotion challenge with another bonus-point victory. Bulls took the lead through an Ed Phillips penalty, won at the scrum which the visitors dominated throughout. The first try came when the referee missed a knock-on in midfield and Bulls spread the ball wide for Josh Deegan to score, with Phillips adding the extras. This match was a far bigger test than Bulls had faced recently as Berkswell & Balsall were able to keep the ball and put multiple phases together. Bulls defended well for the most part but a mixture of ill-discipline and some decisions going against them gave the home side decent field position which they turned this into three points from a penalty. Following a missed penalty by Phillips, Bulls gathered the resulting 22m drop-out and Deegan found fullback Joe Mills bursting through the defensive line. Mills stepped one opponent before drawing his opposite number and fed Phillips who beat the covering defender to dot down under the posts to leave himself an easy conversion for a 17-3 lead. Berkswell & Balsall entered the 22m several times before the half was out but Bulls defended well and cleared the ball up field on every occasion to ease the pressure. After the restart Deegan surprisingly rose above the home side’s second row to claim the kick-off. Bulls put phases together, the forwards made ground and Sam Stoop threw the pass of the game by-passing the forward runner to find centre Matt Goode who finished smartly in the corner. More Bulls ill-discipline led to the home side sensing an opportunity. Bulls defended a set-piece but the home side executed the maul to score in the corner to make it 22-10, leaving the outcome in the balance. Bulls needed one more try for the bonus point and it came from Goode, this time with a trade mark strong run through the defence before rounding the fullback to score in the corner. In the closing stages Bulls had to play with 14 men as yellow cards were shown for Sean Banister and Stoop. But Bulls held strong despite Berkswell & Balsall battering away at the line until Phillips cleared the ball off the pitch for full-time whistle. Bulls will be looking to maintain their advantage when they entertain Droitwich in Saturday’s fixture.